HARARE – Zimbabwe has once again attracted unwanted global interest in the wake of the trail of terror left by the country’s security forces. In an unusually candid rebuke of Zimbabwe, President Cyril Ramaphosa’s governing African National Congress (ANC) of South Africa — a sister liberation movement to Zanu PF — has raised serious concerns about the deteriorating political and economic situation in Zimbabwe. It also warned that the vicious and on-going crackdown by Zimbabwe’s gung-ho security forces against opposition and pro-democracy groups could cause regional instability. The ANC’s warning comes as South Africa’s main opposition party, the Democratic Alliance (DA), is putting massive pressure on Ramaphosa and his government to take urgent steps to stop the crackdown against dissenting voices in Zimbabwe. The DA also warned ominously that should Ramaphosa fail to intervene in the matter decisively, the party would soon call upon the International Criminal Court (ICC) to investigate President Emmerson Mnangagwa’s government. “In the wake of recent announcements of fuel price hikes, citizens have protested, with tragic loss of life. “The fuel price hikes understandably have dire impact on the cost of living of ordinary Zimbabweans. This is a matter of serious concern to the ANC. “South Africa has a proud record of working towards building a continent and world which is safer and better. It is therefore incumbent upon the ANC and the South African government to assist the people and leaders of the DRC and Zimbabwe to do everything in their power to bring about political stability and peace in their countries, so that they can deal with the economic challenges they are facing. “All initiatives in this regard should be guided by the objectives of Sadc and the African Union, in particular the objective of the AU Agenda 2063, to silence all guns by 2020,” the ANC said. “The ANC continues to engage with all political parties in Zimbabwe and the DRC, to encourage them to work towards a peaceful solution and political stability, so that all efforts can go towards socio-economic development and reconstruction. “The ANC notes that unless the situations in both countries are attended to quickly and effectively, an increase in economic and political refugees is inevitable. “We therefore believe that it is in the best interests of the two countries and their neighbours, including South Africa, to explore all avenues, to ensure that the situations in the DRC and Zimbabwe are stabilised as soon as possible,” South Africa’s governing party added. Last week, police and soldiers were engaged in running battles with protesters who flooded the streets of Harare, Bulawayo and other towns — to demonstrate against the steep fuel price hikes which were announced by Mnangagwa ahead of his tour of Eastern Europe. Only this week, rights groups reported continuing human rights abuses by security forces — including galling allegations that soldiers had raped women and girls during their much-condemned crackdown against innocent civilians. Writing on Twitter, Mnangagwa said he would leave no stone unturned in dealing “decisively” with rogue members of the security forces found to have taken part in human rights abuses and the deaths of civilians during last week’s chaos. “One week ago, I announced measures to stabilise our nation’s crucial fuel supply. I was aware that these measures may not be popular, and this was not a decision we took lightly. But it was the right thing to do. What followed was regrettable and tragic. Everyone has the right to protest, but this was not a peaceful protest. “Wanton violence and cynical destruction; looting police stations, stealing guns and uniforms; incitement and threats of violence. This is not the Zimbabwean way,” Mnangagwa said in the first part of his tweets. “I invite leaders of all political parties as well as religious and civil leaders to set aside our differences and come together. What unites us is stronger than what could ever divide us. Let’s begin a national dialogue. Let’s put the economy first. Let’s put the people first,” Mnangagwa added. 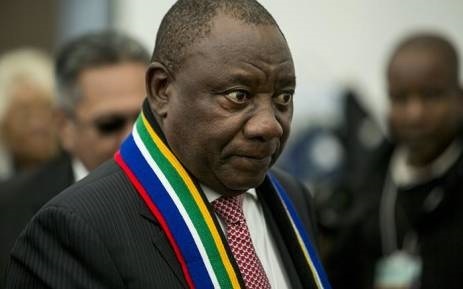 Meanwhile, the DA’s shadow minister for International Relations, Stevens Mokgalapa, warned Ramaphosa to ditch his “quiet diplomacy” on Zimbabwe and order Mnangagwa’s administration to halt on-going rights breaches by security forces. “If Ramaphosa fails to intervene and advise Mnangagwa to stop the military clampdown on civilians, the DA will be left with no option but to approach the International Criminal Court (ICC) to consider a preliminary investigation into these violations as outlined in the Rome Statute. “The DA strongly believes that the human rights crisis currently obtaining in Zimbabwe is of sufficient gravity to warrant an ICC investigation because, according to the Zimbabwe Human Rights NGO Forum, at least 12 people have been killed, 78 shot at and 240 have faced assault, torture, inhumane and degrading treatment,” Mokgalapa said. “… Ramaphosa and his government seem intent on sitting on their hands over the Zimbabwe crisis in much the same manner as Thabo Mbeki’s failed diplomacy. “In 2008, people were attacked and murdered with impunity in another State-sanctioned military clampdown targeting innocent civilians after a disputed election,” Mokgalapa added.